The best thing about the Bulls’ 91-90 win over the Milwaukee Bucks Friday was not Mike Dunleavy’s banked in three-pointer with 5.8 seconds left. Though it was pretty kooky. But it helped a lot more to have Joakim Noah playing like a basketball god with team highs of 21 points, 18 rebounds including nine offensive, three blocks, three steals and second to Kirk Hinrich with five assists. Just to finish it off appropriately, Noah blocked O.J. Mayo’s last attempt rushing down the court as time was about to expire. Get a tape of this game. It’s not one of those instant classics even with the game winner or significant moments for basketball. It was the second game in a week between two teams with losing records, the Bulls nosing up to 9-12 after the victory. But it was perhaps a case study in what people can accomplish when they care, when they put everything they have into what they do. Even in defeat it would have been an object lesson on the human spirit. So it was nice for Noah and the Bulls with all the disappointments thus far to steal a win when they trailed by 11 with 7:37 left and still 88-83 with 90 seconds remaining. But O.J. Mayo carelessly fouled Dunleavy shooting a three a few seconds later. He made all three and then after Mayo fired up a quick and errant three, Boozer hit a baseline 17 footer to tie the game at 88 with 54.9 seconds left. And then it seemed their hearts were going to be broken again when after a brilliant 23 seconds of suffocating, relentless defense, Khris Middleton with a tenth of a second left on the shot clock threw in an unlikely left handed step under shot for a 90-88 Bucks lead with 29.8 seconds remaining. It looked, though, like the Bulls were going down for the count as Jimmy Butler, back after an 11-game absence with turf toe, slipped on a drive to the basket and was called for traveling. Bucks ball with 19.2 seconds left and leading by two. Bulls foul, right? The Bulls perhaps more than any team in the NBA, especially thanks to Noah, have this uncanny ability to draw jump balls on inbounds plays. They had a memorable one on Paul Pierce a few years back to steal a game in Boston, and here they were again. The Bucks inserted Gary Neal for his sure hands and Noah got him. Not only did Noah create the jump ball. But then he won the tip and was one of the three Bulls along with Jimmy Butler and Boozer to set the triple screen that is one of Thibodeau’s favorite late calls and freed up Dunleavy for what became the winner. It was one this beleaguered and lately disjoined Bulls team desperately needed after three straight desultory losses since the win over Miami last week. And there’s nothing like the basketball game Noah played, especially a fourth quarter in which he virtually willed the Bulls to victory with 10 points. From a guy who doesn’t hit game winning shots; or even take them. This isn’t a guy even with a shot, or anything we’ve ever seen resembling one. It’s a player who doesn’t out leap anyone, whose basketball skills are measured in intangibles, the will to beat you, the competitive spirit, the determination to do what he isn’t supposed to be able to do. Players like LeBron James and Kobe Bryant and Kevin Durant may be whom so many aspire. But it is rare the people who possess those natural gifts, though those players do enhance them with their work and effort. Noah is more like everyone else, your everyman who is seven feet all with a shaggy ponytail who stands out because of what he brings in diligence, perseverance and devotion. You really can’t be like Mike. But you can be like Jo. All it takes is trying harder than anyone else. With the Bulls trailing 69-62 entering the fourth quarter after taking a 10-point lead early, it looked like another nightmare finish. But Noah in the fourth quarter alone had 10 points, seven rebounds (six for the entire Bucks team), three blocks and two steals and basically being in every crucial play essentially without any identifiable skill the scouts use to measure great athletes. But it’s how you win games. 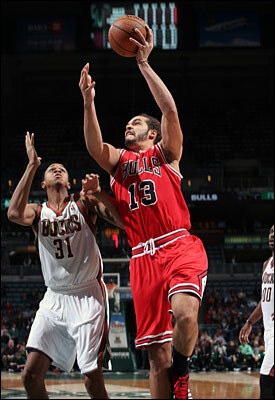 There was much encouraging to see with the Bulls Friday even as they were so close to another loss. Butler’s return was a lift, and he said he came through the game well. “We were all telling each other stick in, we’re going to pull this game out,” related Butler. Luol Deng remained out with an Achilles issue, but Thibodeau said he was close to a return. Though newcomer D.J. Augustin was scoreless in 12 minutes, he showed an ability to run the team first off the bench behind Hinrich in place of Marquis Teague. 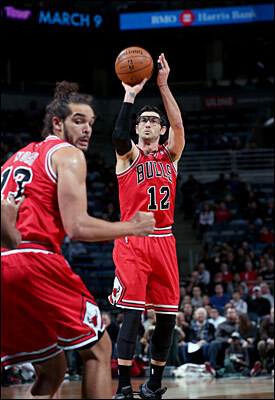 Hinrich got back his shooting, making two of his first three jumpers and finishing with 13 points and eight assists. Boozer added 14 points and 12 assists while the Bulls at least were attempting them this time and were seven of 24 on threes. A pair of early threes by Hinrich got the Bulls off to that fast start with a 26-16 lead with Boozer even coming late in help to get a block as the Bulls closed the first quarter ahead 26-18. But they ran down to open the second quarter to fall behind 51-47 at halftime. Late in the quarter, Noah, who was acting primarily as a playmaker from the high post, got into a sharp exchange with Thibodeau after a Henson basket. Shortly thereafter in a timeout, Noah put his arm around Thibodeau and whispered to him, then came out and made a running lefthanded hook. But I asked Noah isn’t that what enables him to do what he does. Perhaps it’s not the best way to go through every day of your personal life. But it does define him as an athlete. 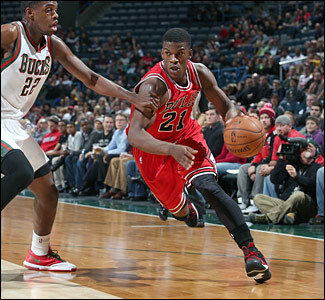 The Bucks, 5-18, began to assert themselves in yet another Bulls less than torrid third quarter as the Bulls shot five of 20 and had 15 points. Milwaukee tinkered with a zone again as the Bulls could not make jump shots, and were taking a few too many. But you could almost read in the way Noah began throwing himself at the basket for rebounds and putbacks, making passes to cutters, dunking the ball on passes that he was determined to see the team get this one. Noah tipped in a Gibson miss early in the final quarter and dunked on a Gibson pass as the Bulls got within 74-70 three minutes in. But the Bucks scored seven straight to take an 11-point lead and it looked like another loss. Tony Snell, who looked uncertain much of the game, made a big three after which Noah spun inside for a score after helping force a 24-second violation. Butler put his head down and drove for a basket as he mostly disdained the long shot after a few errant tries early. Still, it seemed like the Bulls didn’t have enough when Hinrich clanked a three and the offense stopped and the Bulls had a 24-second violation. But Noah drove in for a score in his gangly, arms flailing style to get within 83-79, and then he got on the boards the next Bulls possession for a pair of tips to get a basket and cut the deficit to 84-81 with 3:33 left. Noah just would not stop. But after the Bulls got within 86-83 with 2:33 left, right handed Middleton threw in that left handed hope and it looked like the Bulls would stop here.